First, the really bad horrible Paint image I drew. So, really, how this would go is you would buy about five yards of fabric. 45" wide is fine. 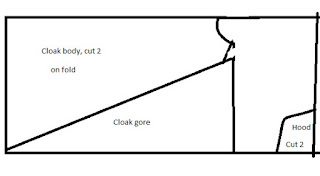 You then take maybe a 1/2 yard and cut out a square with the upper right corner curved off. This is your hood. The rest of the fabric, you fold you are cutting the cloak body pieces - both a front and a back- on the normal fold of the fabric. They will be narrow and the left over gore pieces won't be as big as it looks in the picture. This is just to give you a general idea of the shapes. Really, measure from your shoulder to the top of your head. This is the measurement you need for how "tall" the square/rectangle of the hood will be. Also, measure from the back of your head to your forehead. Add an inch. This is how "long" the hood should be. Draw out the rectangle based on these measurements. Add a slight curve to the upper right and cut out the hood. Sew up along the curved lines. You'll add this to the cloak last. It's really a big trapezoid with sloped shoulders and a curve for your neck. Measure from the center of your collarbone to the end of your shoulders. This is for the top of the trapezoid measurement. 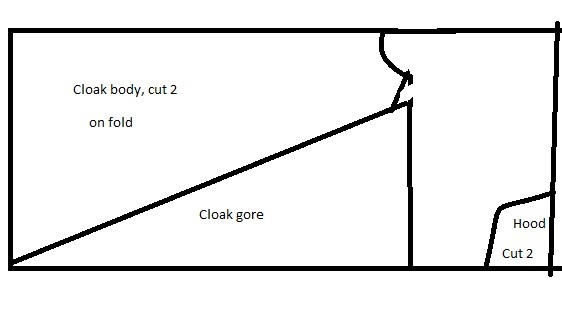 Then, measure how long you want your cloak to be. For the purposes of these instructions, we'll say 40" which is roughly knee length to mid-calf for many people. Taking a measuring tape, measure from the bottom edge up 40". At the 40" mark, draw a line that measures the same as from the center to the end of your shoulders plus 1/2". From the end of that shorter line - say about 8", draw another line going straight down to the corner of the fabric opposite that you started from. You now have a trapezoid. Starting from the folded edge of the fabric, measure about 3" or 4" in and mark that point. On the long trapezoid line, mark about 1" down from the start of that line (it's also the end of the short line). From the point that is 3" or 4" in on the short line, draw line to the 1" down point. This is your shoulder slope. For the neckline, you are drawing a circle of your neck but you'll want more room in the front than in the back. Cutting out a quarter circle will help to start but, once you cut out everything, cut the front another 1" deeper. This will help to not feel like you are choking. The gores are really just continuing the straight short line across the fabric. You'll sew these to the sides of the cloak body first and then sew the front and back of the cloak together. Sew the hood on matching up the center back. Hem and sew up the edges. This is pretty simple and you don't have to do the hood. Cut out any lining fabric in the same way. You'll have to cut out the front opening if you cut it out exactly this way. You can also just cut out the body on the edge and have a back center seam.